ICT Tip: Millions of “paper” books and magazines are available to read on-line through Google Books! Quick overview: Millions of paper books and magazines that have been scanned and placed on the Google Books website. 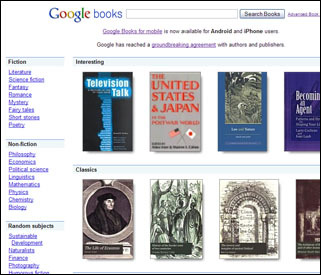 How does it work: Google Books (books.google.com) has been dutifully scanning paper books and magazines since 2004. Like a virtual library, students can read through books featuring short stories, classic literature, math, physics, poetry, science fiction, biology, linguistics, and so on. However, due to copyright laws, some books are only a few pages (limited preview) while others are complete (full view) and can be read from cover to cover. How can it be used in the classroom: I recommend that you familiarize yourself with the “Advanced Book Search” capability which allows you or your students to search for full view books by subject, author, title, publisher, language, publication date, ISBN or ISSN. While I admit that reading an entire book on a computer screen can be tedious, students can use Google Books to search for a specific topic and then read the relevant chapters in relation to their research topic. Sources could be quoted the same as they would with a traditional book. Copyright information: If you’d like more information on copyrights and what has been placed on Google Books, I suggest you read the agreement that Google has reached with authors and publishers. This entry was posted in Tools and Apps and tagged books, ebook, google, google books. Bookmark the permalink.